And a Happy Festivus to all. Let the AOG commence! FRANK: Welcome, new comers. 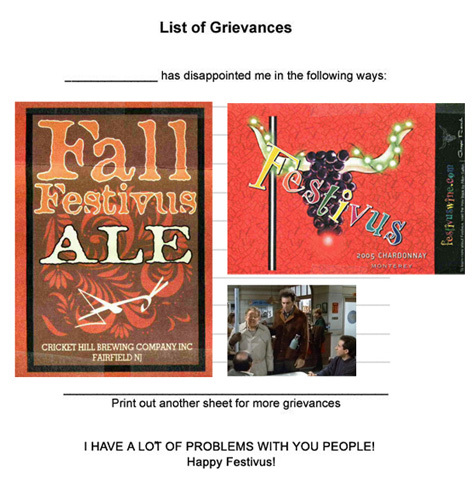 The tradition of Festivus begins with the airing of grievances. I got a lot of problems with you people! And now you’re gonna hear about it! You, Kruger. My son tells me your company stinks! Festivus is a secular holiday alternative to Christmas, Hanukkah, and Kwanzaa, popularized in the December 18, 1997 episode of Seinfeld, The Strike. It is celebrated December 23rd. The Ale is from Cricket Hill of New Jersey and the wine (above) is from Pecan Ridge of Oklahoma.